I decided to try a new block in efforts to tame more of my strings. This time strings were cut to 1.5" strips and then cut to pieces in lengths between 2" and 4". Here's my test strip. I made this block with my new 1/4" foot. It's off just a tidge and I will have to move my stitch line over (minus one). There are also too many of the same fabrics in this block. I guess that's why they call it a test block. This block was inspired by a quilt I found on Pinterest. Thanks, Margaret's Hope Chest blog post. I finished my Terry's Treasures QA quilt... and love it! I made these Japanese x and + blocks as some samples. I need to organize my scraps a little more before I start one of these. These scraps are a little too random for me. I finished my Geese blocks for the Block Lotto just in time to get the sneak peek for next month. I loaded a LQG charity quilt on the frame and started in with my Circle Lord swirls template. I finished some swap blocks for our LQG monthly swap. 3. Spring Mystery loaded 2/26/13 Eyelashes to rip out! Happy Memorial Day! Remember those who served and the purpose behind Memorial Day. Here's what's on the frame this week. It's a charity quilt from our local quilt guild made by Faba. The print fabric has a Noah's Ark theme. I took the easy way out and quilted it in swirls. Here are my nine "Geese" blocks for the May Block Lotto. I can't believe that I made them so late in the month. It's been a busy busy month, but they are done. Whohoo! Here's my Friday Finish for this week. It's one of my favorites! It was supposed to be for my co-worker's first baby. But we found out this week that she is expecting a boy. Oh well... looks like I'll get to start another quilt! The strips and squares and binding were all cut with the Accuquilt GO! Baby! Fast fast fast. Mine is a little different because I made the quilt smaller by deleting the spacer rows. I'm also linking up with Confessions of a Fabric Addict. Happy Mail from a Friend! What a sweet surprise I got in the mail this past week. My dear friend, Julianne, sent scrappy trip blocks to surprise me for Mother's Day. Aren't they beautiful! LOVE the bright oranges. Julianne and I love joining quiltalongs and swaps. Usually one of us finds it, tells the other, and we're both on a roll making blocks. I'm starting to back away from a lot of the swaps at the moment. But I still love joining QA's. It's awesome to have quilty friends to share more than quilty stuff. We're probably lucky we live on two different sides of the United States. We'd probably shop for fabric if we lived closer. I bet my little boy would love to meet her adorable granddaughter though. Well, the end of the school year is here. Today's the last day of preschool. My little guy is so excited to go to a new school next year for kindergarten. Things on the quilting front will be slowed down a bit (but not completely) until school starts in the fall. We have waterparks to explore, camping, hiking trails, and just play time planned. But here's what happened this week. I finished LQG #1 quilt (9-patch). Here's the blocks for my partner in the Block Swap Adventure. I cut a little quilt back for this LQG charity quilt. I'll be longarming it for one of our members. It's loaded on the frame. I finished longarming this Terry's Treasures QA quilt. The friend I made it for had her ultrasound this week. It's a BOY! Guess we'll see something on my new projects list. Here are the two blocks that I sent to my partner, Dawnelle, in Washington (state). She requested a block in southwest colors. 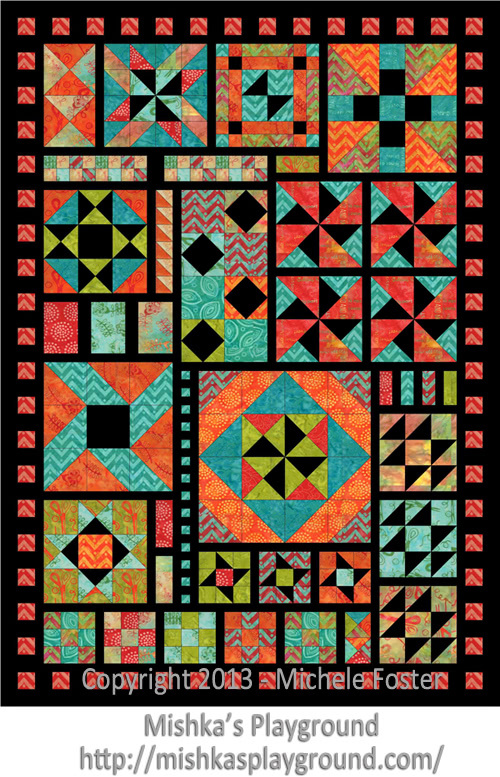 Have you seen Michele Foster's (from The Quilting Gallery) upcoming quiltalong? It's called Aiming for Accuracy. She designed a quilt in EQ7. It is JUST GORGEOUS! It would be a great scrap buster. I don't think I can resist this one. Check it out!!! My son and I LOVE to go to local garage sales. Here's a little something that I found. There's yardage for quilt backs in this pile!!! Of course I only found one simple orange. Quilt magazines 2/$1. With finds like this I think I will let my subscriptions run out. Do you get quilt magazines? I like Fons & Porter's Love of Quilting and Quiltmaker. What are your favorites? Blanch the broccoli and cauliflower and then chop. Add everything in a large bowl add the dressing and toss. Place in the fridge for 4 hours and serve. Another member of the local quilt guild has trusted me with her quilt for longarming. I grabbed a simple fabric from my stash for a solid, plain back. It's half loaded on the frame already. Here's the first little quilt that I volunteered to longarm for our local quilt guild. 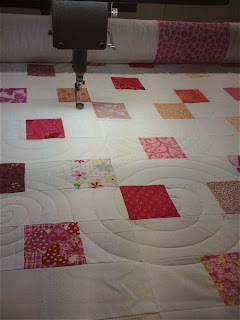 I love the swirled quilting! Even though this is a simple 9-patch, this quilt was a challenge for me because it was all stitched by someone by hand. First I had to re-finish all the seam ends so that it didn't pop apart on the frame. This is also the first time I used my swirls template. But it's done!!! It measures a small 30" x 47.5". I backed it with some "Three Blind Mice" fabric that I had hoping some little one would like it. Here's a better shot of the swirls. I think I can use this template on A LOT of quilts!!! Here's what's on the frame today. It's my Terry's Treasures QA. You can find it here. I just love these swirls! I finished row three of my Finding Nemo scrappy trip quilt. I tamed all the 2.5" scraps ends of the scrappy trip by sewing all the pieces smaller than 16" end to end. I can't wait to see what this makes. I made a simple quilt back for the Terry Treasures QA. 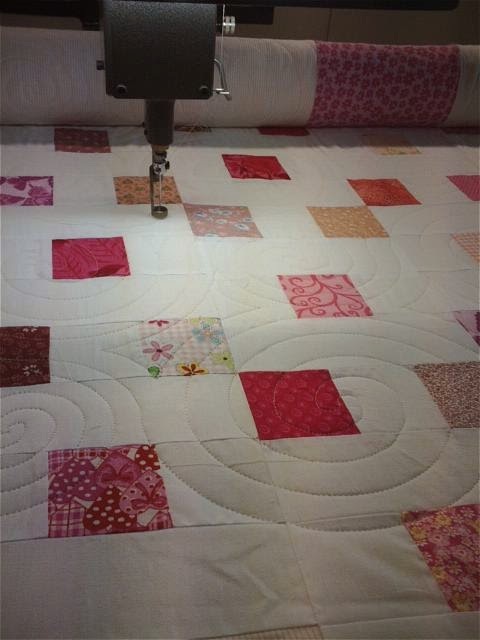 This quilt is loaded on the longarm now. I plan to quilt it with my new Circle Lords swirl template. LOVE this template!!! I finished my bear/rainbow quilt. It has moved on to its home already! You can it here. I completed my May obligation for the Block Swap Adventure and mailed it on its way. 2. LQG 9-patch charity quilt. Here's a couple recipes friends posted on facebook. Sorry I don't know the source to give credit. You'll love this recipe so much, you won't want to lose it....be sure to click the word "SHARE" and it will appear on your facebook page so you'll be able to fi...nd it easily. GREAT "light" recipe! Mix all ingredients together in a large bowl and toss with reduced fat ranch dressing. Loaded Baked Potato Salad - Mix ½ cup softened butter, ½ cup sour cream, ½ cup shredded extra sharp cheddar, ¼ cup chopped chives, 8 strips thick cooked crumble...d bacon. Fold mixture with 4 large cubed cooked potatoes. Salt and pepper to perfection and serve warm! Reserve some bacon or cheese for the topping. Hearty, delicious chicken and pasta dish with a little southwest or Mexican kick. These are filling and comfort food at it’s best! Make them for company and you’ll be the hit of the party! Cook pasta shells in well salted, boiling water until al dente (still have a little bite to them) If you cook them too long, they will be difficult to stuff, plus they will have additional cooking time, once they are stuffed. Drain the pasta and set aside while you make the filling. To make the filling, mix diced chicken, drained black beans, green onions, diced peppers, black olives, and cumin in a large mixing bowl. Thoroughly incorporate all the ingredients. Spread 3/4 c. picante sauce in the bottom of a large baking pan. (I used 13x18x2, but I’m guessing that two 9×13′s would also work.) Reserve the final 1/4 cup, for later.Using a spoon, or your fingers, fill each of your cooked and cooled pasta shells, setting them into the picante covered pan. Continue until all shells are filled and arranged in the pan. When the pan is full, drizzle the shells with the remaining 1/4 cup of picante and then sprinkle with the shredded cheddar cheese.Cover the baking pan tightly with foil and bake at 350 degrees for about 30 minutes or until hot and bubbly. THIS IS SOOOO GOOD! I JUST WANTED TO REPOST IT FOR THOSE WHO MAY HAVE MISSED IT THE FIRST TIME!! -SO YUMMY! GARLIC & LEMON CHICKEN W/GREEN BEANS & RED POTATOE...S! (Please SHARE so that it saves to your timeline. You can refer back to recipe later!). Ticks can be troublesome outdoor pests, as they feed off the blood of mammals, and can carry and transfer bacteria and disease such as Lyme dise...ase. Some retail products are designed to repel ticks, but these are many times high-priced items and no more effective than a simple homemade solution. Finding Nemo Scrappy Trip Progress - Three Rows!